Fujin no Ippyô (婦人の一票) - Votes for Women, the sixth design from the new series Hyakunen no Hana - Flowers of a Hundred Years, self-printed in an edition of 100 in April 2015. Paper size: 33.5 x 47 cm. Series title and print title in blindprinting in the top left margin; signed in blindprinting and pencil in the bottom margin. 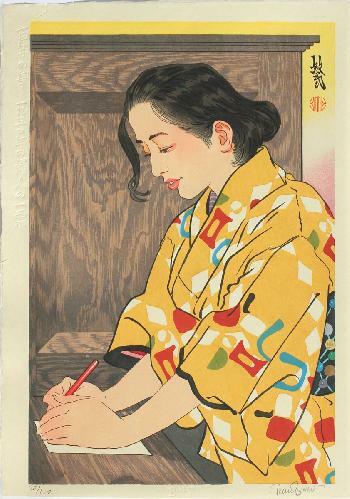 The sixth of a series of 10 bijin prints illustrating women in the decades of the 20th century. This print shows the introduction of universal suffrage after WWII: the young woman is in a polling booth, casting her vote. Fine impression, colours and condition: use of 23 carat gold leaf, silver and bronze pigments, and lacquer printing in the hair.